The journal ‚Der Antike Sudan. Mitteilungen der Sudanarchäologischen Gesellschaft zu Berlin e. V.‘ (MittSAG) is an annual publication. It publishes articles on the archaeology, history and culture of (ancient) Sudan. It informs about projects that have been supported by the SAG e.V. and about projects, which are run by members of the SAG or which SAG members have been part of. 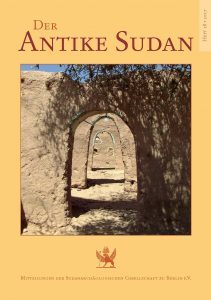 Additionally, the annual ‚Fritz Hintze Lecture on the Archaeology of Sudan‘ is being published in the volume follwing the year in which the lecture was delivered. The journal ‚Der Antike Sudan‘ (MittSAG) has become an internationally renowned publication and it is now drawing not only a broad international readership but also attacts contributions by researchers from all over the world. On our website you find contents lists for all volumes of the MittSAG and of all special volumes as well as downloads of the individual articles – except those of the current volumes of the past two years. The current volume is MittSAG 28/2017.